Fire-Fast Trekker. Best Emergency Waterproof Survival Fire Starter. Magnesium and Euro Fire Steel Ferro Rod. Compact Durable Tool for Bushcraft, Camping, Backpacking, Hiking, Hunting, or Bug Out Bag. EXCELLENT TOOL FOR OUTDOOR USE. MAKE HUNDREDS OF FIRES WITHOUT THE NEED FOR MATCHES, LIGHTER FLUID ETC. EVEN WORKS IF IT GETS WET. THIS IS THE BEST FIRE STARTER YOU WILL EVER OWN. VERY STURDY AND TOUGH, WILL WITHSTAND ALL SORTS OF ABUSE. DROP IT IN THE RIVER, BASH IT AGAINST ROCKS, DROP IT FROM HEIGHTS, IT WILL KEEP ON WORKING. WON'T FALL APART. 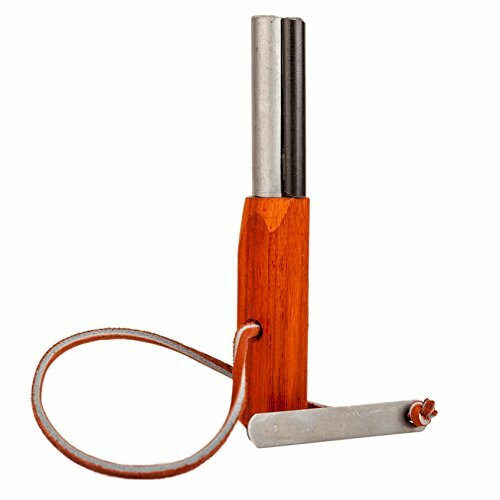 Survival Grade Fire Starter. 9.5mm Flint. Magnesium is 3/4 inch diameter by 3 inches long. Sturdy Hard Wood Handle 3 1/4 inches long. 2000 plus Fire Starts. 3/4 inch Military Grade Magnesium Core (97% pure). Will light in extreme conditions. Sharpened Steel Striker (won't cut skin) included. Use striker to shave both magnesium from the rod and tinder from the handle. Easy to hold with gloves or in cold weather. Striker won't bend or break. Hard Wood handle can be shaved and used for tinder - a great advantage when no dry tinder can be found. 9.5mm Flint. The large diameter, European (not Chinese) manufactured flint ensures many fire starts. View More In Stove Accessories. If you have any questions about this product by Fire-Fast Survival Gear, contact us by completing and submitting the form below. If you are looking for a specif part number, please include it with your message.